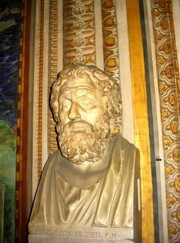 The main entrance of the Vatican Museums is located in Viale Del Vaticano, 10 minutes by walk from the Peter's Square. The unique art trail through the 14 museums of 50,000 objects is 7 miles long. 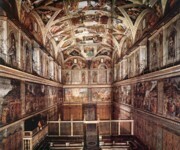 In this tour you’ll discover the most significant religious and cultural areas of the Vatican Museums, within the Pio Clementino Museum, the Gallery of maps, the Tapestry Gallery, Raphael’s Rooms and finally the Sistine Chapel. In the "Galleria degli Arazzi" (Tapestry Gallery) hang the Flemish tapestries, which adorned the Sistine Chapel on holidays. In addition, you can see three paintings by Raphael, in whose you can see, how the artist changed his style in only a short time. The Assumption of Mary is still characterized by the severe Renaissance style of Perugino, the Umbrian teacher of Raphael. The Transfiguration of Christ is the last picture that Raphael painted before his death in 1520 at the age of only 37 years. It is already an anticipation of the Baroque and is of the greatest artworks ever. The four Rooms of Raphael were among the Apartments on the second floor of the Vatican Palace, which Julius II chose as his residence and are a really highlight of are Renaissance painting. 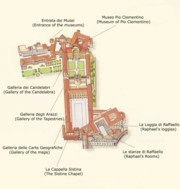 The picturesque facilities we owe Raphael and his pupils, which made these works between 1508 and 1524. Raphael painted the thirteen arcades of the Rooms with scenes from the Old Testament and only one fresco from the New Testament. 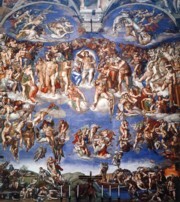 The “Last Judgement”, one of Michelangelo’s latest artworks at the altar wall of the Sistine Chapel, was cause of many scandals, already since its creation in 1541. A naked Christ with saints, Risen and Damned, also naked, that was too much for the time of the Counter-Reformation. So Michelangelo and his pupil Daniele di Volterra had to draw a veil around them. 453 years later, when the scaffolding fell for the second time, the artwork shined in the original colours of the artist but this time there was no scandal. The Scala Regia (Royal Staircase) was designed by Bernini and connects the Sistine Chapel and the Vatican palaces of St. Peter's Basilica.